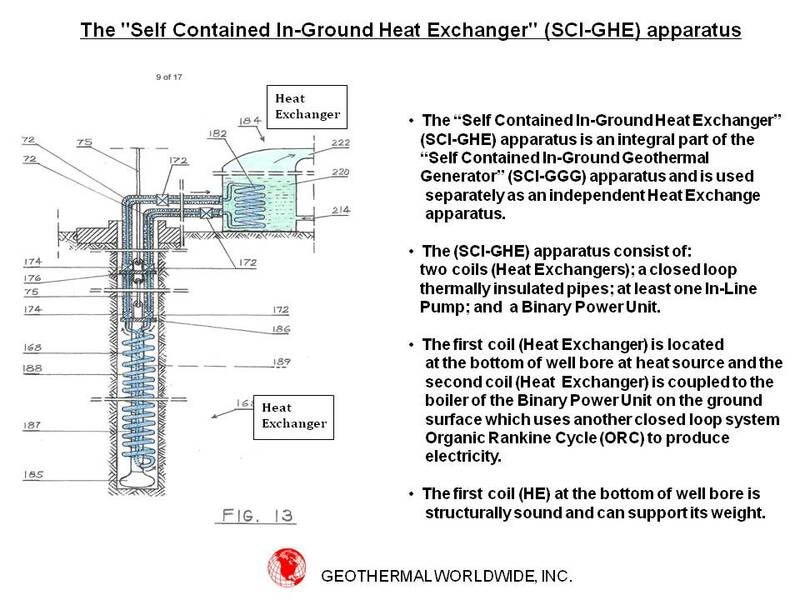 The "Self Contained In-Ground Heat Exchanger" (SCI-GHE) system is an integral part of the "Self Contained In-Ground Geothermal Generator" (SCI-GGG) system and functions as a heat exchanger (closed loop cooling system). Here is used separately as independent heat exchanger apparatus. 2. Absorbing heat from hot rocks and transferring heat through closed loop system to the binary power unit on the ground surface which produce electricity. The "Self Contained In-Ground Heat Exchanger" (SCI-GHE) system consists of several main elements: a least one well bore; closed loop thermally insulated line with a few in-line pumps incorporated into line; two coiled pipe - heat exchangers; and a binary power unit. Two coiled pipes - heat exchangers, are parts of closed loop line - first one is lowered at the bottom of the well bore and second one is coupled into binary power unit on the ground surface. By lowering first coiled pipe (heat exchanger) in predrilled well bore to the hot rocks, heat from hot rocks is absorbed and transported with fluid circulating trough closed loop line to the second coiled pipe (heat exchanger) which is engaged with binary power unit on the ground surface which produces electricity by using Organic Rankine Cycle (ORC) which is then transported through electric grid to the houses and industry. The (SCI-GHE) system uses several completely closed loop system and eliminates the issues of injection water, concentration of brine, filtration, separation, equipment corrosion, scaling, and ground water pollution, etc., and at no time is there any contact with the environment by the working fluid or the heat exchange fluid therefore it doesn’t pollutes environment. The power plant on the ground surface consist of three binary power units each working with different working fluid having different boiling point. The heat exchangers on the ground surface are then used as a source of heat for additional production of electricity. 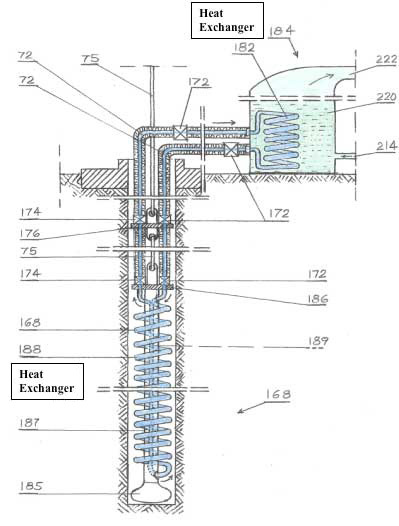 Alternatively, the heat exchanger on the ground surface can be used, with additional heat exchanger, for heating individual buildings and/or entirely district. The plurality of wells with system of heat exchangers on the ground surfaces provides an efficient (SCI-GHE) power plant. Although main purpose of the (SCI-GHE) system is to use limitless dry hot rocks for production of electricity, the (SCI-GHE) system is not limited to dry hot rocks - it can be lowered into existing hydrothermal reservoir or can be suspended with cable over lava flow (lava tube) in locations such as Hawaii. 5. Temperature of the hot rocks; and Heat Flux. 3. To lower apparatus at the bottom of deeper well bore.